Since I began writing for the ‘CopperSkillet' I have told you about many different herbs. However, I have never mentioned the most important, the most common, the most popular, " BASIL". In my travels around the city, I always get the same response when I explain I sell fresh herbs. “Oh, you sell Basil" is the comment I get most. This is only natural as in scanning the recipes in the papers and magazines, most often they will call for Basil. The sun loving Basil has been cultivated for at least four thousand years. Native to Asia and Africa, Basil found its way to what is now Iran, then Greece, Italy, and to Britain. Basil also grows well in South America, Mexico, and the Pacifc Islands. Records back to 1726 show up to fifty varieties under cultivation in Britain. 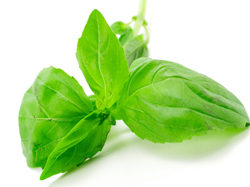 Sweet Basil is the most common, both for flavour as well as hardiness in the garden. Other popular varieties are lemon, opal, cinnamon, Thai, and the lettuce leaf basil. The lore of Basil is quite contradictory with some countries holding it sacred while others showing fright. One of the most popular histories tells of Empress Helena finding Basil on the site of the crucifiction and from there taking it to Greece. Culinary uses of Basil are many, from the ever popular Pesto to salads, spagetti sauce, any tomato dish, fish, chicken, beef and veal. One area herbs are neglected in is desserts. Sorbets, breads, puddings and other desserts can be sparked with the flavour of fresh herbs. With the onset of spring and berry season, the following is a must for you to try. In a food processor or blender, puree 1 cup raspberries and the basil. Spoon into 6-1/2 cup soufle dishes or ramekins. Divide remaining raspberries among the dishes. In the top of a double boiler, whisk egg yolks until foamy. Whisk in water and cook, whisking constantly, until pale yellow. Whisk in Framboise and continue cooking, whisking constantly, until mixture is very fluffy and mounds slightly. Remove from heat and whisk until cool. Fold in whipped cream or cream fraiche and sugar. Spoon over raspberries and place under broiler until lightly browned around the edges, about 2 or 3 minutes. Watch carefully and do not let topping get too brown. This must be served immediately and can not be prepared ahead, but does go together rather quickly. One might try adding a lovely glass of champagne as raspberries seem to have an affinity for champagne. Remember that spring is upon us and it is gardening time. Anyone interested in starting their own herb garden, I will have an excellent selection of potted herbs for you. The price will be as great as the quality, so give me a call.